Schaaf-Yang syndrome (SYS) is a relatively new genetic disorder only first being identified in 2013. The full spectrum of SYS features still need to be defined and while we know a disruption of the Magel2 gene results in SYS, we are not year clear on HOW this disruption leads to the characteristics of SYS. In order to advance SYS research, we need to better understand the role of Magel2 at the cellular level, develop key resource tools, such as cellular and animal models for pre-clinical studies, and better define the natural history of SYS. We need your help! Join us in our mission to find treatments, and a cure, for Schaaf-Yang syndrome! it's easy to reach out to family and friends! Support our research plan as we work for treatments and a cure, for SYS. The projects identified for 2019 are critical to developing a strong research foundation that can support future SYS clinical trials and it is expected we will need approximately $250,000 to complete this work. We can do this! But How? 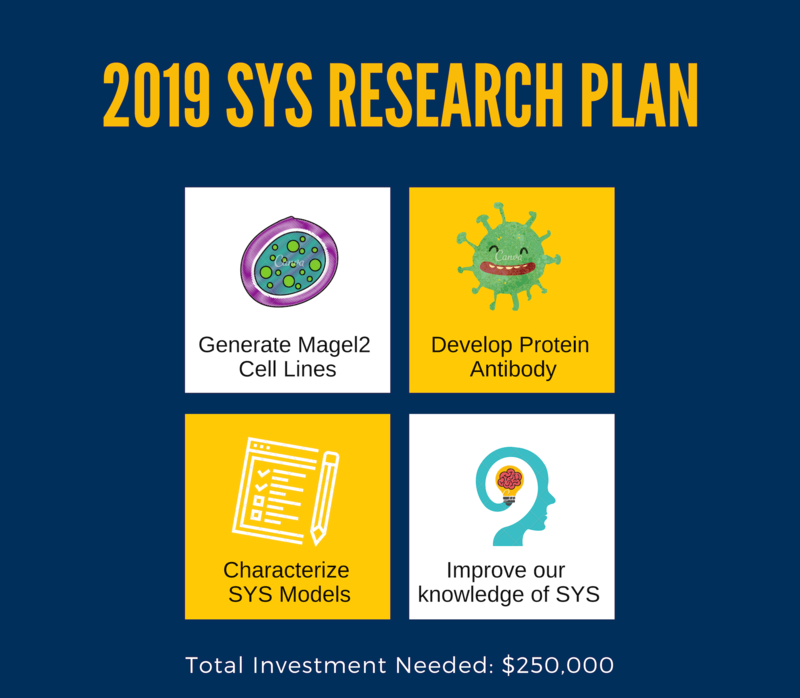 We invite every member of the SYS community to join us in 2019 as we raise the funds necessary to complete our research strategy. Here are 3 ways you can help. It's easy to get started fundraising, just ask 5 people in your network to make a donation. Need help getting started? Email us at research@fpwr.org and we will provide you the tools, tips and resources you need. 100% of proceeds fund SYS research.